Had to make do with instant noodles for breakfast this morning coz I overslept. It was raining like mad through the night (Red Storm Warning hoisted at 4am) and I slept like there's no tomorrow. 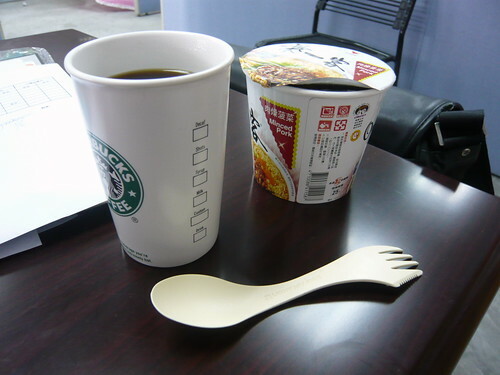 So anyway, that's the spork that I bought in Hong Kong. Not cheap at HKD 25 (I resisted buying the Titanium version at HKD 240) but it is days like these where I get to use it to eat noodles with one end and la kopi with the other.